Thank you very much for the new features! P.S. I have updated the screenshot for the TPFC entry, hope you're OK with it (animated .gif with 4 frames and 5 seconds delay). Is there a way I can mark the episodes I already watched? 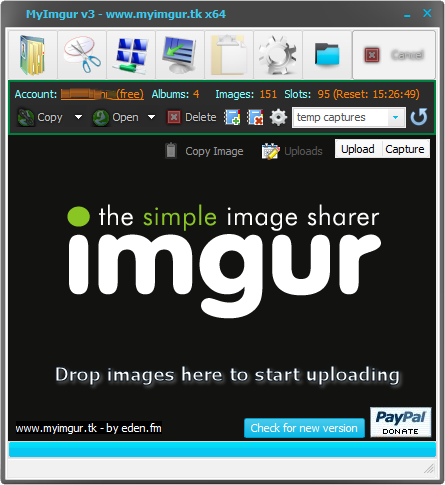 Screenshot Captor / Re: Portable? Sorry to revive such an old thread, but I don't think there is a need to open a new one with the same subject. SC portable creates a registry key and doesn't remove it upon exit: HKEY_CURRENT_USER\RtColorPicker. Could this be avoided in any way? It doesn't affect the portability, but it makes SC not stealth. 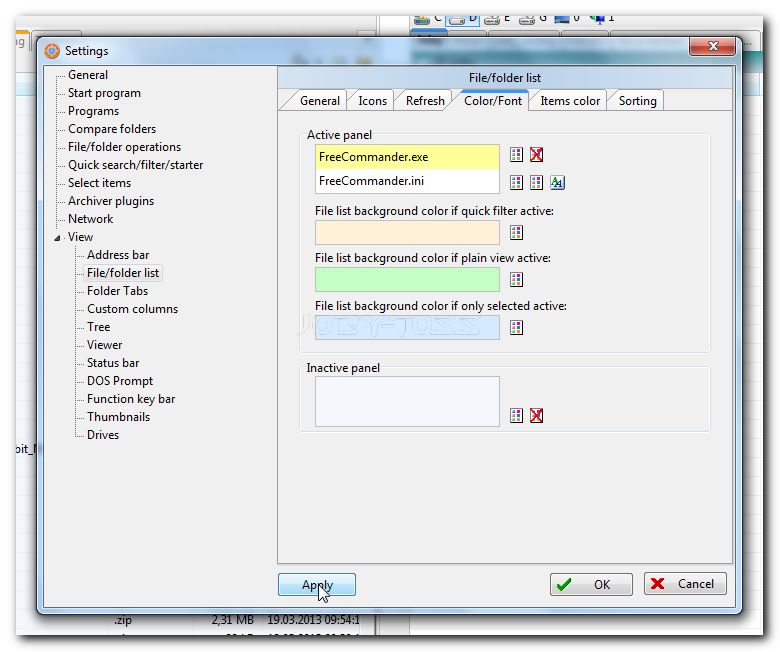 Second issue: the ColorCop v5.4.5 tool included in the portable zip file is not portable anymore, but the previous version 5.3 is. Can this one be included in SC portable zip package instead? Screenshot Captor / Re: Links to Reviews and Comments - Add yours! @mouser: if you have any observation, please tell me so I can modify the database entry accordingly. 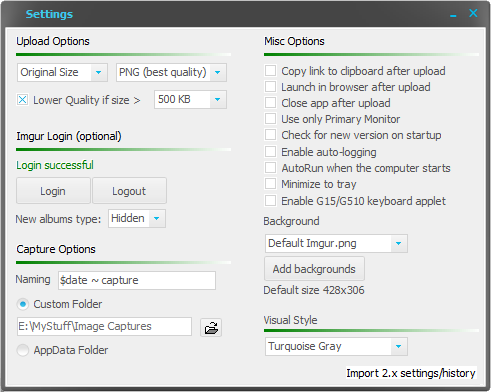 Is there any setting in SC 4 (built-in upload tool) that allows copying the uploaded image link into clipboard including [img] tags, for quick posting in different forums? If not, could this be added? I think it would be useful for people doing lots of tutorials, demos etc. First of all, I am not affiliated with MyImgur software, developer or website; nor with Imgur.com. 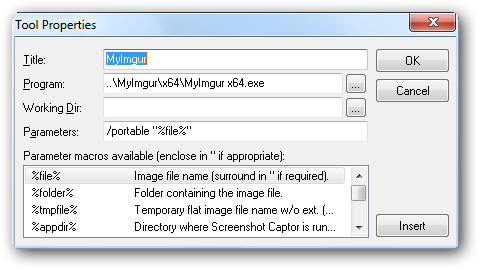 MyImgur is a free (for personal use) tool to quickly upload pictures to imgur.com; once uploaded, the program can copy a link to the file directly to your clipboard. It has also many other functions, including full Imgur account support. What I like the most about this is that it is portable, has 32 and 64 bit versions and it is able to open-> send image-> copy link-> close without user intervention. Oops! Should've read the forums more often! 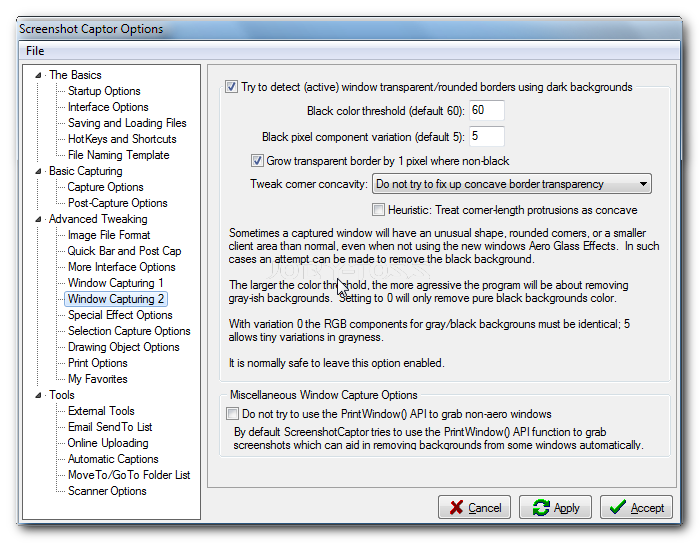 Using SC 3.29.01 portable on win7x64sp1; trying to capture the Settings (child window) of FreeCommander XE using "Grab Active window"; the border includes parts of the main app. Works fine with different other apps. Might be some bad setting? Oops, didn't think to check that! I'm visiting again this topic, again with a problem. I'm using SC v3.03.01 on Windows7x64sp1. I'm trying to capture a program's window, together with its pop-up window. 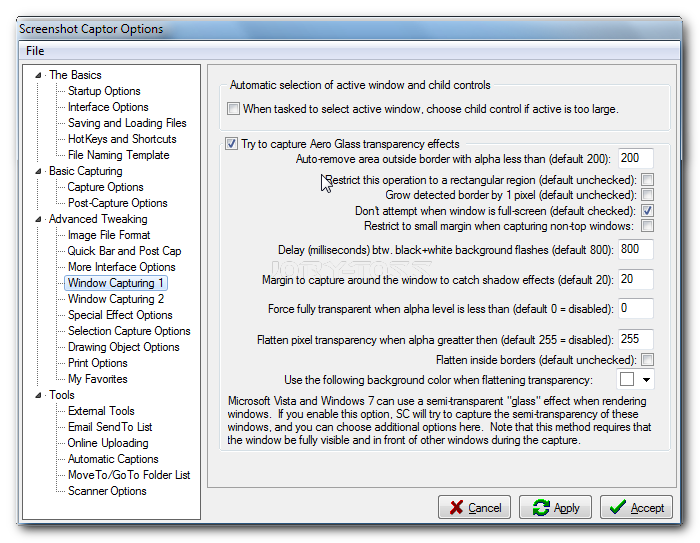 I'm using "Grab windows Object or Scrolling window" option, because "Grab Active window" option only captures the pop-up window. I've just added Trout to TPFC ! Edit: is it build in AutoHotkeyL? I can't play files with Unicode characters in their names. Might be asking a bit much, but I'd love to see Unicode support in this app. I'm curious how the Gui will be. I expect he's using Lazarus since the 32 bit was Delphi. Of course they all should be returned! If you'll add as an option to search only for visible ones, even better! General Software Discussion / Re: Revisiting disc catalogers - is Cathy still the best? I still use it, so for me it is still the best! I only miss text files preview (first lines at least). If you don't mind spending some bucks, go with WhereIsIt! There is nothing better! You can disable the plugins and make it as fast as Cathy, or enable just the ones you need. OK. FC settings window, the settings for SC are the ones from your last screenshot. Weird results (I only changed that 200 value to 0)! When I open the third one in Gimp, I see the Alpha channel; not for the first two (same settings used to capture); what's wrong? 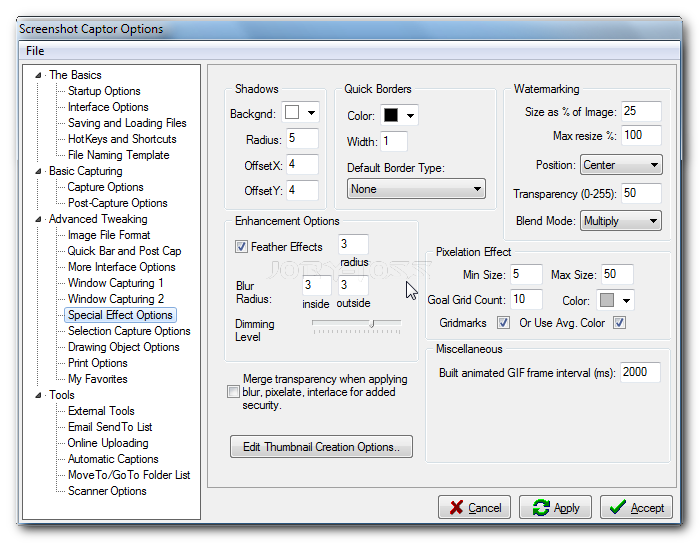 Method of capture: right-click SC's tray icon, left click Grab Active window, fast left click - select the desired window to be captured (otherwise the result is not satisfying). As I'm sick of the Apple-ish term "dock", and also in the light of the unavoidable development-path-change, I suggest we smile a bit while reading each other's ideas about the names we imagine for the next version's codename. I hope I'm not offending anyone by doing this as this trend was started by Markham himself in the license discussion thread. My favorite screensaver is the one from SE-soft . It is free and has also a portable version. The nicest thing about it is the "dim" feature (don't know how else to call it) that allows you to see what's "under" the screen saver (don't know exactly what it saves while used this way but it is very cool). So I have mine setup to show the clock and I can still see what apps are opened.